They really do need to be retired. A national spotlight fell on Texas’ voting equipment last week after some voters complained that their votes on electronic voting machines had changed. State election officials chalked it up to user error. Critics alleged malfeasance or a software bug. The Austin-based company behind the machines says an important piece of context is missing from this debate: these machines are 16 years old. “It’s very much like someone calling Apple and asking for support on their iPhone 1,” said Steven Sockwell, vice president of marketing at Hart InterCivic. Most Texas counties last upgraded their electronic voting machines well over a decade ago, tapping billions in funds Congress approved to upgrade voting equipment around the country following election irregularities during the 2000 presidential election. Dozens of Texas counties purchased Hart’s eSlate machines. 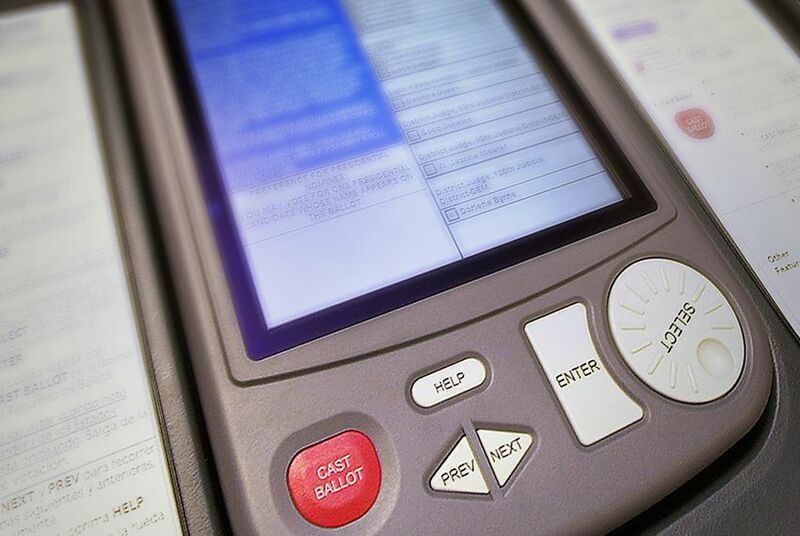 While Sockwell said that the eSlate machines “have not been performing any differently” than they have in previous elections, he said it is time for municipalities to upgrade to Hart’s newer voter system, which is called Verity. The eSlate machines generally have a lifespan of between 10 and 15 years, he said, though he added that they do not stop working after 15 years. [Rice computer science professor Dan] Wallach said that he is surprised that Texas’ eSlate machines have lasted as long as they have. See here for the background. For the record, the first iPhones came out in 2007, so these machines are mostly at least five years older than that. However you view their utility and security today, the day is coming – likely soon – when we will have no choice but to replace these machines. At some point, they’re just not going to work anymore. A shower. A meal. A place to sleep. Those basic needs come to mind when most think of the homeless. Our Calling, a Dallas nonprofit, has given the homeless an iPhone app. The faith-based nonprofit is using technology to help people who live under bridges, near crack houses and in encampments. The Our Calling app can be used by the homeless to find shelters, food pantries, free meals and job training. Others can use it to snap a photo to direct staff and volunteers to the GPS location where a homeless person may be in need. Wayne Walker, executive director of Our Calling, learned about the power of technology while working as a software developer during college and seminary. He discovered that many homeless people didn’t know where to turn for food or shelter — and they sometimes got bad phone numbers or directions. He started a website, helpimhomeless.com, with a list of local resources. Later, he created a booklet of resources printed in a large font with ink that won’t smear in the rain. The booklet is now used by police, Dallas residents, homeless people and Our Calling’s “search and rescue” teams. The volunteer teams visit camps, wooded areas and other sites to bring water, food and clothes. They encourage the homeless to move into shelters and direct them to support services, such as drug treatment and counseling. Almost every day, Walker said, he answers calls from homeless people who live across the country and find the group’s website. Our Calling also uses a robust mobile database. Staff and volunteers use iPads to record interactions with each person, who is listed by name, photo and personal history. The database has helped flag women who may be victims of domestic abuse or keep track of a person’s medications. It can help staff remember the name of someone’s spouse or a prayer request. The Our Calling app is currently for iPhone only, but an Android version is coming in January. Other cities have other apps, but this one sounds like the most robust. If we don’t have this or something like it for Houston, we should. Mayor Parker did a lot to reduce homelessness during her term. A lot of that was a matter of connecting the people who had the need with the resources that could help them. This can be a project for the next Mayor to take that further. Gaioz Nigalidze’s rise through the ranks of professional chess began in 2007, the year the first iPhone was released. In hindsight, the timing might not be coincidental. On Saturday, Nigalidze, the 25-year-old reigning Georgian champion, was competing in the 17th annual Dubai Open Chess Tournament when his opponent spotted something strange. Petrosian complained to the officials. After Nigalidze left the bathroom once more, officials inspected the interior and say they found an iPhone wrapped in toilet paper and hidden behind the toilet. Nigalidze was expelled from the tournament, which is still ongoing and features more than 70 grandmasters from 43 countries competing for a first-place prize of $12,000. The Georgian’s career is now under a microscope. His two national titles are under suspicion. And under recently tightened rules against cheating, he could be banned for up to 15 years. But the scandal threatens to spread far beyond the gleaming white Dubai Chess and Culture Club, which is shaped like a giant rook. Nigalidze’s expulsion is a nightmare scenario for chess: proof positive that technologically enabled cheating, rumored about for more than a decade, is now pervasive. Thanks to smartphones, the game of kings is starting to look like the game of crooks. I’d say chess doesn’t have a technology problem so much as it has a security procedures problem. How is getting up to use the bathroom after every single move not suspicious on its face? I presume that Nigalidze had to be doing something like that in other matches as well – surely no one test drives their cheating methodology at such a high level event. Basic measures such as limiting bathroom use to something a bit less frequent, and requiring a chaperone for competitors who get up from the table for any reason during a match would have sniffed this out quickly or prevented it in the first place. The World Chess Federation needs to hire a security consultant, stat. My game is bridge, and the tournament bridge scene has had its share of cheating scandals over the years. The main difference is that successful cheating at bridge generally requires some form of surreptitious communication between partners, which as those examples show can be ingeniously low-tech. Still, the American Contract Bridge League does regulate the use of electronic devices at its tournaments. There are programs available to analyze the play of the hand, which I’m sure would be as useful as Nigalidze’s app, I just can’t imagine anyone getting up from the table during the play of a hand to use the bathroom and try to consult with such a program. But hey, I could be wrong about that. I hope the powers that be at the ACBL and the World Bridge Federation are paying attentio to this brouhaha. The Harris County Sheriff’s Office and Sheriff Adrian Garcia has launched a series of free smartphone apps that will allow residents to report any crime tips or suspicious activities by sending text messages, emails, photos and video attachments. It’s called iWatchHarrisCounty and is part of the department’s “If You See Something, Say Something” campaign launched in conjunction with the Department of Homeland Security last year. You can also text a tip to 1-855-HCSO-iWatch (1-855-427-6492). Online, you can visit the iwatchharriscounty.com website to report a crime. I’d say this counts as a Gov 2.0 app. Some commenters at that post are making references to Big Brother and totalitarianism, which frankly strike me as ridiculous. I don’t see how this is substantively different from calling a tip line like Crimestoppers, and we’ve had that for decades. Sure you could report something phony this way, but you could have done that before. Unless you believe that the Sheriff is about to start arresting people (or worse) for things that aren’t actually crimes, we’re no closer to dystopia than we’ve ever been. KTRK has more. While most [San Antonio] area school districts maintain policies that ban students from using cell phones on campus, a few districts are breaking the mold and beginning to admit smart phones into the classroom as an educational tool on a par with a classroom computer. Though some may think the change will invite distraction, inappropriate texting or cyber bullying into study sessions, others see the move as a way to teach technological skills while addressing those negative issues head-on. Alamo Heights Independent School District recently changed its policy to allow students to bring personal electronic devices — laptops, iPads and smart phones — to use for educational purposes at the discretion of the teacher. It’s backing that policy change with content-filtered, districtwide Wi-Fi access for such devices. Alamo Heights is one of only a few San Antonio locations where such a policy is in place. North East Independent School District also will implement a more flexible cell phone policy this fall. Alamo Heights is a wealthy district – as the story says, about 90% of its students have s computer and Internet access at home – so their pioneering spirit in this regard isn’t a surprise to me, but I’m still glad to see them try to get their arms around this rather than try to maintain a strict ban. I hope they will provide a model for others to follow. If you go back and listen to my interview with Rep. Scott Hochberg, he’s clearly thinking along these lines as well, with the goal of having the state provide tools like e-book readers to students as part of their classroom experience. It will be very interesting to see how this plays out. Have you ever found yourself walking around downtown Houston and wondering about the history of the place? If you have a cellphone with you, you can take a self-guided tour. Launched in March, Downtown Mobile Info begins at Wortham Center, winding throughout downtown, hitting spots like Sesquicentennial Park and Sabine Promenade before ending about an hour later. There are multiple access points to start the tour. Development and planning for the mobile tour started roughly a year ago. Visitors can access a map and audio files of the tour at http://houstondmi.org. Klumb said more sites will be added to the route this summer. More is available at http://www.downtownhouston.org/guidedetail/audio-walking-tours. It’s not quite what I had in mind when I said I wanted to see Houston-centric smartphone apps developed, but it’s a start. And as a reminder, there’s an app to tell you what building you’re looking at, too. Sometimes – okay, pretty much all of the time – I love living in this century. If you get called in for jury duty in Harris County, you can now get free WiFi in the Jury Assembly Room. But once you get into a courtroom, and especially if you get empaneled, you should expect to have to unplug. If you think you’re going to use your spanking new iPhone to entertain yourself next time you’re on jury duty, think again. Judges are going to take an even dimmer view of jury member use of Blackberry, iPhone or other electronic devices as a judicial policy-setting group has told district judges they should restrict jurors from using electronic technologies to research or communicate. The Judicial Conference Committee on Court Administration and Case Management for the United States District Courts said it developed instructions that would be issued by judges, “to address the increasing incidence of juror use of such devices as cellular telephones or computers to conduct research on the Internet or communicate with others about cases. Such use has resulted in mistrials, exclusion of jurors, and imposition of fines. The suggested instructions specifically inform jurors that they are prohibited from using these technologies in the courtroom, in deliberations, or outside the courthouse to communicate about or research cases on which they currently serve, the group stated. Specifically, those instruction spell out that jurors should not you should not consult dictionaries or reference materials, search the internet, websites, blogs, or use any other electronic tools to obtain information either before the trial, during deliberations or after until the judge instructs otherwise. The instructions state jurors must not use cell phones, e-mail, Blackberry, iPhone, text messaging, or on Twitter, or communicate through any blog or website, through any internet chat room, or by way of any other social networking websites, including Facebook, MySpace, LinkedIn, and YouTube. In the old days, judges instructed jurors not to read the newspaper or watch the news, or discuss the case with anyone. This isn’t really different from that, it’s just a revision for modern forms of news and discussion. Better to spell it all out than to risk a mistrial somewhere because a juror didn’t realize that not discussing the case meant not posting a Facebook status update about it, too. Hey, Houston! Steal this idea! Something like this needs to happen here in Houston. The BigApps competition, in which [New York City] made its data available to developers so they could make apps out of them that would be helpful to citizens, and offered prizes to the best entries, closed last night with a ceremony and the announcement of three grand prize winners, a popular favorite chosen by the public, and six honorable mentions. Some of them are available already on iTunes, and we expect the others will be soon. The key to all this was New York making its data available so the apps creators could do their thing. I feel confident that if Houston did the same, and made sure that fact was known, our own app development community would jump on it. Even without a contest and a cash prize – though of course those things couldn’t hurt – we’d likely see some cool and useful stuff. But it all starts with making the data available, and making sure people know that it’s available. Smartphone app writers of the town, unite! Want to count calories, diagnose car trouble or kill time fighting an imaginary war? There’s a Houston-made app for that. As sales of smart phones continue to grow, local technology advocates hope to make Houston a hotbed for developing mobile applications. Early mobile apps in the U.S. came from Silicon Valley, New York and Boston, according to Gartner. But because Houston also has a large software development community, especially around the energy and health care industries, creating phone apps here makes sense, said William Clark, a research vice president at Gartner. “You have that skill base, and it’s a logical way to train your developers,” he said. Locally, individual entrepreneurs and established firms are banking on everything from games to health care to engineering apps. May I suggest that y’all don’t forget about government and public service apps? There’s a lot of opportunity to do something genuinely useful there. I hope that the new year will bring more of this to Houston. Welcome to a movement the tech crowd is calling “Gov 2.0” — where mobile technology and GPS apps are helping give citizens like Newmark more of a say in how their local tax money is spent. It’s public service for the digital age. A host of larger U.S. cities from San Francisco to New York quietly have been releasing treasure troves of public data to Web and mobile application developers. That may sound dull. But tech geeks transform banal local government spreadsheets about train schedules, complaint systems, potholes, street lamp repairs and city garbage into useful applications for mobile phones and the Web. The aim is to let citizens report problems to their governments more easily and accurately; and to put public information, which otherwise may be buried in file cabinets and Excel files, at the fingertips of taxpayers. Peter Brown specifically mentioned using this kind of technology during his Mayoral campaign. I hope that it’s an area where he was able to influence Mayor-Elect Parker while he was supporting her during the runoff. The thing about this is that the main expense the city would incur is in making its own data publicly available in a usable format like XML. Once the data is out there, app developers will jump on it and take it from there. Some thought needs to be given to how to manage users’ expectations – just because you submit a photo of a pothole doesn’t mean it’ll get fixed immediately, for instance – but as long as people understand what this sort of thing is all about, I think it’ll be a big hit. Thanks to Martha, who has some other suggestions for how to leverage these innovations, for the link. Right now it’s for the iPhone (if I can get my hands on a Blackberry I’ll test it there, too), and uses the iPhone’s geolocation feature to display the interesting buildings near where the user is standing. Downtown Houston and Galveston are two of the areas it is designed for. It also works well in Chicago, Los Angeles, Tokyo, London, and a few other cities. At the time I received this, I was totally focused on the Houston runoffs, and I told him I’d mention this on the blog once that was over. Well, I promptly forgot about it, but was thankfully reminded by this Swamplot post about it. As noted, all you need to do is point the iPhone’s browser to Towrs.com and it should just work. I’m not iPhone-enabled, so I can’t vouch for it myself, but if you want to know more, drop Wayne a note to editor@houstonarchitecture.com and let him know. Happy sightseeing! Beginning today, VIA Metropolitan Transit bus riders who power up their portable electronic devices — such as laptop computers or Wi-Fi-enabled cell phones — might notice an Internet signal coming from within the bus. VIA has started a monthlong pilot program offering free wireless Internet on some express routes to determine whether riders would use the service. If it’s popular, the agency could begin equipping more buses with wireless access. Next year, VIA will be adding hybrid-electric, full-electric and compressed natural gas buses to its fleet, Parker said, and Wi-Fi technology could be added to them. “Before we make the investment (in the Wi-Fi technology), we want to make sure customers would use it,” he said. Hey, more WiFi is always better than less WiFi, so I say bring in on, VIA, and may Metro look with favor upon this as well. I have no idea how popular this will be, as I kind of doubt too many people will break out their laptops while on the bus – among other things, bus rides are usually bumpy; I wouldn’t want to risk having my laptop slide off my lap – but at $50 a month per bus for the service, it doesn’t need to be used much to be worthwhile. I hope that VIA and other local transit entities will give some thought to empowering smartphone users in other ways, as being able to predict when a bus will arrive and knowing where it will go would be a large enticement for potential riders. There’s a lot of ways that the ubiquity of smartphones can make the transit experience better, and many of them are very low cost. A forward-thinking transit authority should take advantage of them in every way it can. Of course you can use your iPhone to avoid red light cameras and speed traps. Dwight tells us about it. Most Houston drivers know that the city has set up cameras at certain intersections to snap photos of those who run red lights. The drivers are then fined, with a copy of the photo and a notice to pay sent to the house to the address associated with the vehicle’s registration. But most drivers don’t know exactly where these cameras are, unless they’ve consulted any of several maps that show their locations. Now there’s a free iPhone app called Trapster that alerts you to the cameras as you approach them. Trapster also warns when you may be approaching a speed trap. The latest version works with the notification feature of the new iPhone OS 3.0 to alert you even if the app isn’t running. Trapster uses a database of 400,000 known traps, augmented by user reports. If you’ve got the app, you can report a speed trap or red-light camera just by tapping a button as you pass it. Other users of Trapster can vote on the veracity of your report, which helps improve the reliability and accuracy of the database. There are other options if you aren’t iPhone-enabled, the most effective of which is simply not running red lights or speeding. Boring, I know, but as driving while playing with one’s phone is dangerous, it’s probably for the best. Created by a former Texas House staffer, My Texas Lege provides all the important information needed to contact your member of the Legislature including staff contacts. “Contacting your elected officials and their staff should never be a difficult endeavor. We have created two versions, a paid version (Plus) and a free version (Lite), so that everyone with an iPhone can find their elected officials in seconds,” stated Mynor Rodriguez, designer and developer of My Texas Lege. 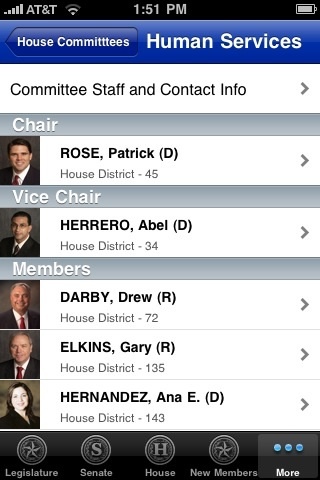 Utilizing the new powerful iPhone OS 3.0, My Texas Lege Plus allows you to direct dial the members’ offices, use Google ™ Maps to find district offices, and email the member and their staff from your phone. It will be regularly updated to reflect office staff changes. Starting in Fall 2009, My Texas Lege Plus will include 2010 Texas Campaigns Expansion Pack providing information all the state races. Mynor is a blogging colleague of mine – he used to have a blog called The Red State, which is no longer active, and he’s still a member in good standing of the Texas Progressive Alliance. There are a couple of other ways you can get Lege info on your iPhone. One is via the Texas Legislature Online, the official state site, which has a page that’s optimized for PDAs. The MyTexasLege app has some advantages over the TLO site – most of MTL’s data is stored on your smartphone, so it’s accessible even when you have no connectivity, and it has details about things like staff names and email addresses, more biographical info, and better search capabilities. There’s also an app called Pocket Patriot, which can be found here, put out by a lobbyist firm called The Patriot Group. They’re a Republican shop, with clients like Texans for Rick Perry, Texans for Lawsuit Reform, Texas Public Policy Foundation, and Bob Perry, so needless to say I would not recommend their application. They also don’t have a free version, for what it’s worth. Anyway, the Lege may be out of session again, but Austin and district offices are staffed year-round, and the campaign season will soon be upon us. 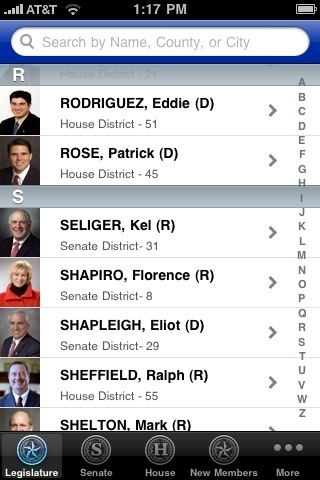 If you like having that information handy on your iPhone, you should check out MyTexasLege and see what you think. Studying on your laptop is so 2007. A group of biology students at Houston Community College’s southeast campus just turns on iPhones. “Instead of bringing your book to class, you bring your phone,” said Lisa Jackson, one of 15 students enrolled in Anatomy and Physiology II as part of a pilot project to deliver course work on Apple’s trendy smart phones. Lifang Tien, a biology professor, and Roger Boston, who teaches computer science and business technology, received $100,196 from a fund created by HCC Chancellor Mary Spangler to encourage innovation, then used the money to buy phones and pay the monthly bills. Students have to give the phones back at the end of the semester. In return, Tien and Boston are studying whether delivering instruction on a phone that can connect to the Internet anytime and anywhere makes a difference in how students learn. Tien’s students like the convenience. Tiffany DeBurr Brewer has studied in her car while her three kids raced noisily around the house. There’s the cool factor, too, giving students one of the hottest gadgets. “Our kids, they are so into this,” Tien said. That’s very cool. Even if it does make me feel very old. Now if you’ll excuse me, I need to go yell at a cloud.